Vol. 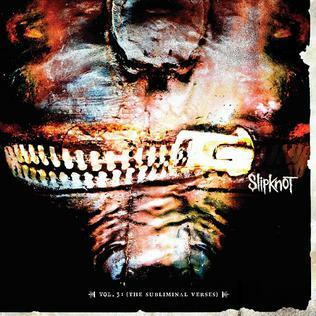 3 The Subliminal Verses is the third major label studio album by American heavy metal band Slipknot. The album was released on May 25, 2004, through Roadrunner Records, and a special edition, containing a bonus disc, was released on April 12, 2005. It is the band’s only album produced by Rick Rubin, and also the only one not to feature profanity. Following the band’s tour to promote its second album in 2002, speculation regarding the future began. Some band members had already been involved in side projects including Murderdolls, To My Surprise, and the reformation of Stone Sour. In 2003, Slipknot moved into The Mansion to work on the album. Initially, the band was unproductive; lead vocalist Corey Taylor was drinking heavily. Nevertheless, they wrote more than enough material for a new album—the band’s first to incorporate more traditional, melodic song structures, guitar solos and acoustic guitars.